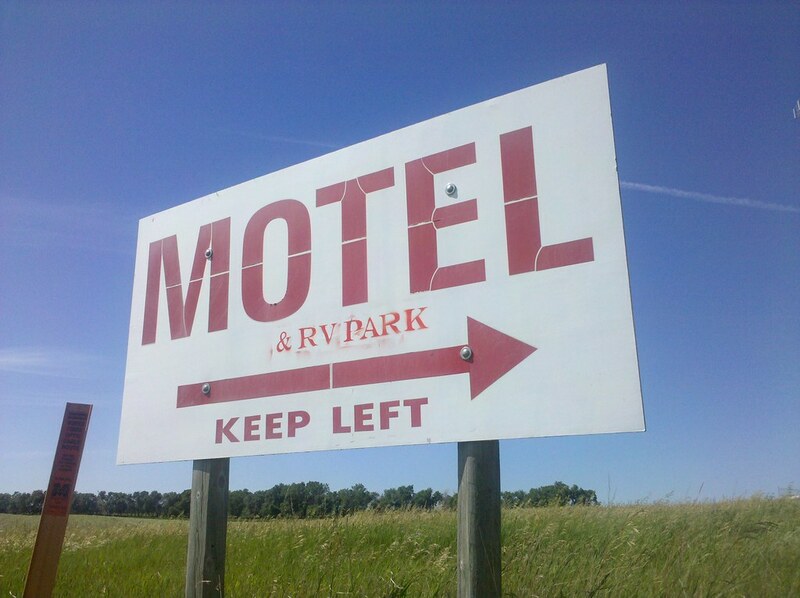 Though this is a confusing sign, I’d take it over the total lack of signs when I got lost in Virginia last summer. Then again lost is a favorite past time of mine. ditto. Lefty’s rule. My favorite was my lefty mugg…with the hole on the one side..so a righty drinker would use it and spill beverage on them. We lefty’s are left out in a right handers world, but we are at least in our right mind!!! I have e-mailed the Chamber of Commerce in RockAway Beach, OR to see if they would present the lapel pins to Matt as he reaches the Pacific Ocean. If we add one for his home state of VA as well as an American flag pin; the cost should be no more than $36 to $37 including postage. We have 5 people including myself, you, Karen, Candice and MN Roxanne who said they would ante up. The cost would be about $7.40 each in cluding shipping. I could just have he pins shipped directly to the Chamber of Commerce in RockAway Beach, OR. I’ll contribute to the pins also. Just let me know who to send it to. Don – I’d like to contribute too. Must have missed a post about this earlier. You can contact me at jreeves7@roadrunner.com. Thanks! Don, please see my reply back on the “hat” post. mmmm, dontcha tink that the CoC would be proud to just GIVE the pin to him, seeing as how this has garnered them media attention? and BTW, it’s too late now, but THAT would have been a great idea for him as he was doing the ‘cross-walk’, to get a pin from all the states he traveled. and doesnt it get kinda confusing? his home state is VA but he lived/left from Rockaway Beach, NY? it boggles the mind. I don’t know Matt personally but I am gonna wager most of my pocket change that Matt is from and lives (wen not a hobo) in New York City. And I am gonna bet that to be his home state too. As far as the pin thing goes…ponder this.. remember Matt is doing this – to just do it. Media is not his care in any way. As a matter of fact he told one TV crew he was not gonna stop and talk to them..he had to make up some time…and made them chase him for his interview. That said…maybe it is all about Him, His goal/achievment and his family posibly greeting him there. We can gift him in some other way. I think someone sets up a hobo nation facebook thing…we all take pictures of ourselves celebrating matts safe completion (I am positive thinker don’t ya know) and that is it. Matt is from Virgina and his parents still live their. I read this information about him either on this site or in a news article on the web. I know he is doing this not for publicity but because he wants to see America on foot and the real beauty that is missed by traveling by interstate highways. He also gets to see the (REAL PEOPLE OF AMERICA) and not the want-a-be people. I just wanted to give Matt a small token of apprecaition for what his is providing for all of us on his journey step by step across this great land called America!!! I agree with you, Jeff. Don, I would love to contribute to the pin fund! How do I sign up? done by a sign man after to much pizza & beer at the Matt do drop inn. Reminds me of a funny scene in The Long, Long Trailer when navigator Lucy tries to justify getting Ricky and their humongous house trailer all turned around by saying, ” No, I didn’t say turn right, I told you to turn, right? left! Ann I found a site where I can get all 12 of the individual pins, plus his home state of VA and a United States flag all for $36 to $37 including postage. They will sell 1 or 100 or more. Anna, sorry for not spelling your name correctly. I thought I saw Ann not Anna. Please accept my apology! About the Pin “drive”. I just hope Matt got his hat brim “fixed” by now, via hat pins, lapel pins, safety pins or even good old sewing thread! Matt find a quilter – who’ll put a few stitches through that brim and keep it from separating on you! I’m certainly willing to participate and contribute for a welcoming gift for Matt at Rockaway in appreciation of his accomplishment AND as thanks for the pleasure he has given those of us “vicariously” experiencing his journey. I realize that Matt is “just walkin'” for his own personal reasons. I am just so impressed that he is doing this in such a “simple” manner with so little possessions/baggage. It has made me think, how could I do accomplish such a feat?!?!? 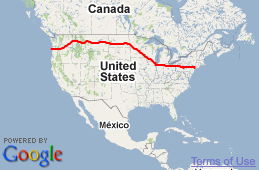 It’s even made me think of logistics for walking North in Alabama (someday – wishful thinking). Matt’s journey is an amazing thing! Anyway – everyone have a great day – I’m going to try and catch up on this day of Matt’s blog before I have to go hit the grindstone. SO…ok…I will anty up. I am sold. I will anty instead of buying on my own. mattwalkingpool@yahoo.com … i will forward from there. after reading you above post…i am good on it and the surprise would be nice to. ok..